We all let out a big sigh of relief after NU recovered against Western Michigan to stay unbeaten. Ultimately, I thought the game was a good indication of how far NU has come – 2 years ago, we lost the exact same game when the Cats traveled to Army. On the pod we all talked about the guys firing each other up after Q1, coming back out and blasting the WMU D; this was a sign of maturity, toughness, & good team chemistry. I’ll also point out, that college football is not easy… no matter who you’re playing. There are a ton of teams (including good ones) who have struggled surprisingly against weak opposition, failed to respond, or have responded by pressing & making mistakes (see: Michigan, who should be 2-1 right now, but for some timely refereeing and Akron just being too horrible to pull it out). Not much to discuss this week – the Cats have a very similar game on the plate vs. Maine. We’re all looking for the squad to come out of the gates strong and execute consistently throughout the game in all three phases. Personally, I’d love to see Malin Jones see some time at SB as well. NU’s projection profile from the Scuzz Model did some serious climbing this week. 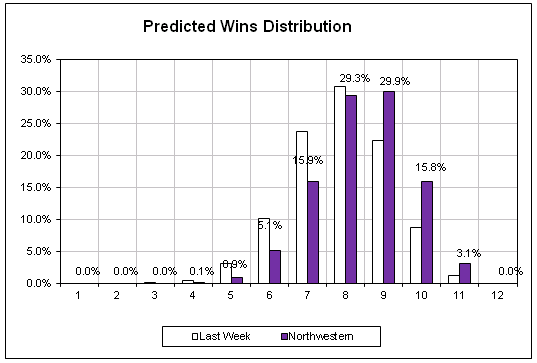 Remember the model only had NU favored by 24, so the Cats met expectations last week as far as my numbers are concerned (31 was always too big of a number). You can see below the Cats chances vs Ohio State have risen significantly – Cal finally proved what John has been railing about all summer: a good offense can score on this OSU team. 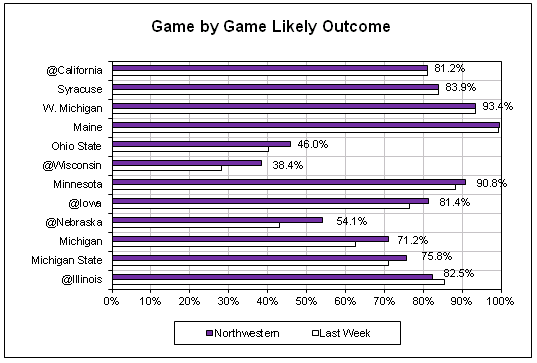 Also Michigan’s struggles, Iowa’s close win, and Wisconsin’s loss have all boosted the Cat’s numbers. Last week’s 7-9 expectations have shifted upward to an 8-10 win expected outcome. Florida (-17) @ Tennessee: .I know better than to rely on the Florida O, but the Vols just took a long trip and ran around chasing Ducks. Hard to believe they can score at all this week. MSU (+7) @ Notre Dame: This game could end 0-0. Ultimately, I think the Irish will win because they’re at home, and their D is geared to stop what MSU’s limited offense can do. That said, no way is this more than a 3 point game – in part because Tommy Rees will certainly score 7 points for MSU over the course of the game. Model favors ND by 4. La Tech (+9) @ Kansas: Who doesn’t want to make money vs Charlie Weis? After seeing Rice beat Kansas, I have little to no belief that he can get his team to win (let alone cover) from week to week. The problem is that La Tech might be terrible. Still, the model actually favors La Tech by 4. IU (+4) vs Missouri: Do you believe in IU? This game is going to be a bonafide shoot out. Missouri has scored points, but doesn’t really put the fear into anyone on either side of the ball. DGB (their stud WR) is looking pretty awesome, but IU’s offense is for real, and their only slip thus far has been a ball-control Navy team that kept them on the sidelines. I actually like IU to win this game at home, but even if not it feels like a 1-3 point contest instead of 4. Scuzz Model favors IU by 2. UTSA (+2.5) @ UTEP: Yes, yes, and yes again. UTSA is better than UTEP. They should absolutely win this game. They are constantly discounted because they are making the move up to FBS, but the Road Runners are talented. The model has them as heavy 2-TD favorites. Have to say, Bama-A&M lived up to the hype (unlike previous games of the century), and I’ve begrudgingly come to respect Manziel a bit – he was fantastic in that game (lucky on 2 key occasions, but damn good). Still, A&M is OUT (and as we’ve said countless times on the podcast – had no business being a national title contender this year… zero defense, and frankly a diminished running game too). Wisconsin all fell out of the undefeated ranks, while Alabama and Oregon are driving the bus… I’m already mad that we won’t get to see them play one another, cause something stupid will invariably happen (like blind squirrel Lane Kiffen finding a nut vs the Ducks), and we’ll get effing Bama vs Lousiville. Or worse, LSU / A&M / Insert SEC school here. Posted on September 20, 2013, in Saturday Morning Stats. Bookmark the permalink. 2 Comments. Not trying to be picky, but how is 9-10 wins the expected outcome…The combined probability of 9-10 wins is about 45% while the combined probability of 8-9 wins is about 60%..While expectations are high, I think 9 wins as an expected outcome is a stretch until and unless the Cats can win either the OSU or WI game. Good point. Let’s chalk that up to selective statistical interpretation. Thanks for the comment – ive adjusted the statement to be more accurate.